﻿ Let there be light! | The Great Shutter Co. Most windows have a window frame and so do our shutters. It is true that installation does involve a small beading around the outside of the window frame that acts as a shutter stop, as you can see in the image, but generally this is much smaller than the outside frame of your UPVC or timber windows, so it has no impact. 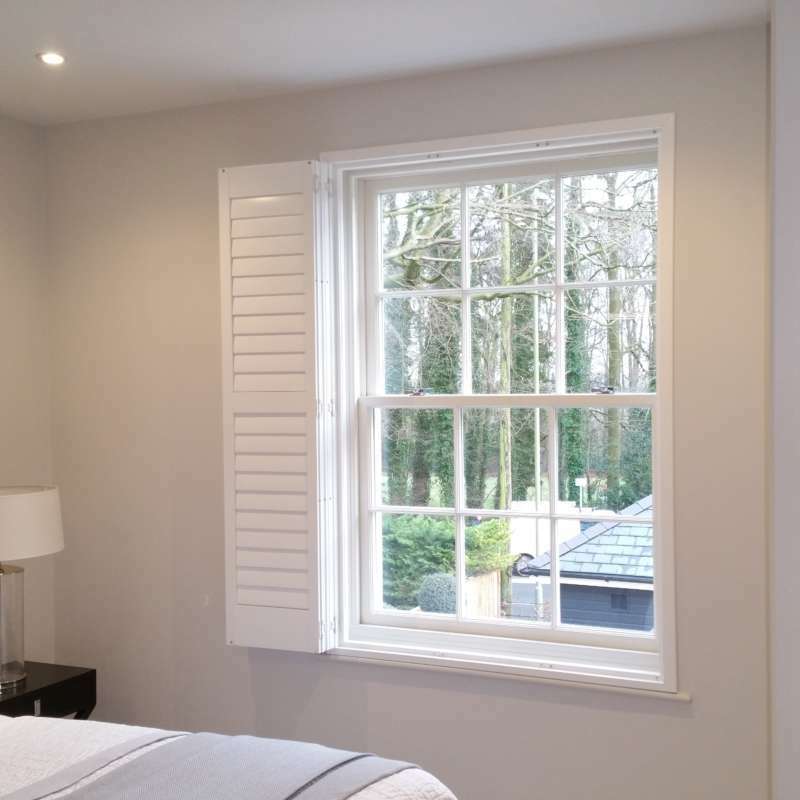 In the case of sash windows you will often see shutters with a mid-rail which allows you to control the top section of shutters independently to the bottom. But if you have casement windows then we can still provide you with the ability to operate top and bottom half independently without the need for mid-rail. This is called a hidden split and because you don't have the fixed mid-rail it doesn't impact on light. You must consider when pondering this question that other window treatments, (as they say in the industry!) or window coverings to you and I will impact the window extremities. Venetians - if you want privacy then you must adjust all the slats while with a shutter you can adjust the bottom into privacy mode while leaving the top in the open position to maximise light. Shutters come in slat sizes from 64mm to 114mm and this means there are options to the number of slats that you can have. If you mount your shutters on the edge of the recess they can folded flat against the wall (see image) - totally opening up the view in a window. With venetians you would have to pull the blind up and the stack of slats at the top would impact on your view. Curtains for example, when open, cover each side of the window a little and the wall obviously. Blinds sit at the top of your window recess when open, some roman blinds cover up to 30% of the window height on smaller windows. Rollers, Romans, curtains do not offer control over privacy because they come from the top down of the recess or are fully drawn. This means that should you want privacy you need to block out all natural light. Plantation shutters, (why when I type does it often say something else instead of shutters?!... amuses me every time!) sit outside of the window frame when open, they sit ideally on the wall to either side, so actually gives the impression of enlarging the window in some cases. 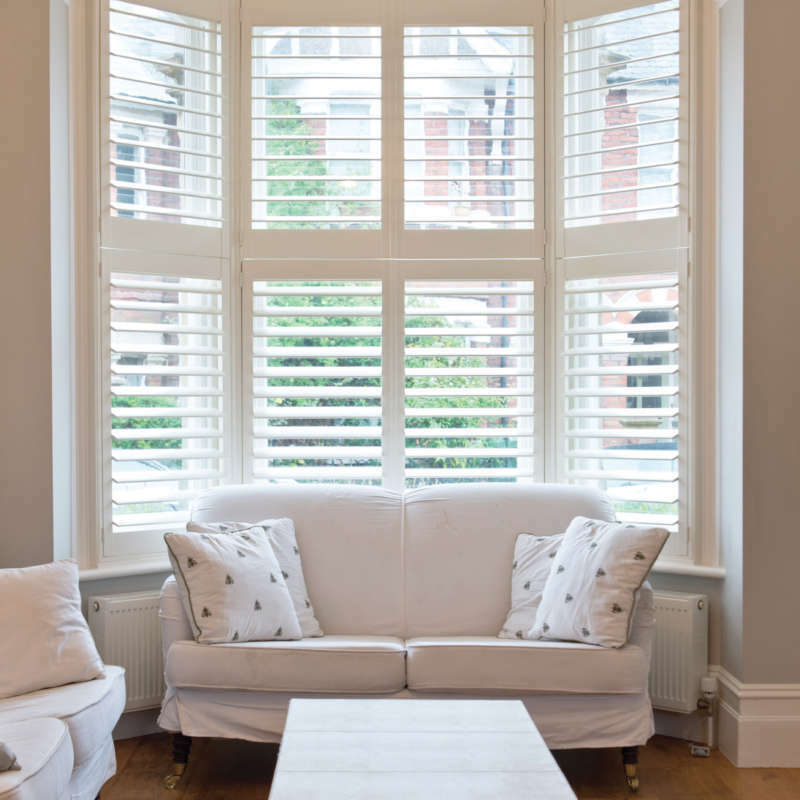 Once again I am led back to the main fantastically great benefit of plantation shutters and that is of course their great versatility to control light and visibility to many degrees. There are so many options with your shutters to suit every time of day, night, every activity, and just so easy to create each option. Hear from our happy customers how shutters have transformed their homes, then give us a call to arrange your free home consultation. We look forward to hearing from you.